CASE STUDY: King of Tea took advantage of Verizon Media's Yahoo Taiwan to give brand awareness and purchase intent a boost. While King of Tea is a well-known and highly regarded brand in Taiwan, it operates in a crowded and competitive marketplace. The company wanted to boost brand loyalty among its customer base, while also raising awareness and driving sales among Taiwan’s tea drinkers as a whole. The brand devised the 'Initial dream' online campaign, with the purpose of helping office workers maintain or rediscover the original passion and purpose of their roles. The brand tasked Verizon Media's Yahoo to provide insights, content, amplification and execution of the campaign via its premium digital-marketing solutions. The overriding objective was to target office workers from 25 to 44 years old who may have been in their roles for a number of years. The campaign sought to communicate with the target audience on an emotional level, while simultaneously enhancing the King of Tea brand and consumer loyalty. The campaign had three core elements; content and creative, media, and social—all designed to engage consumers on a personal level. 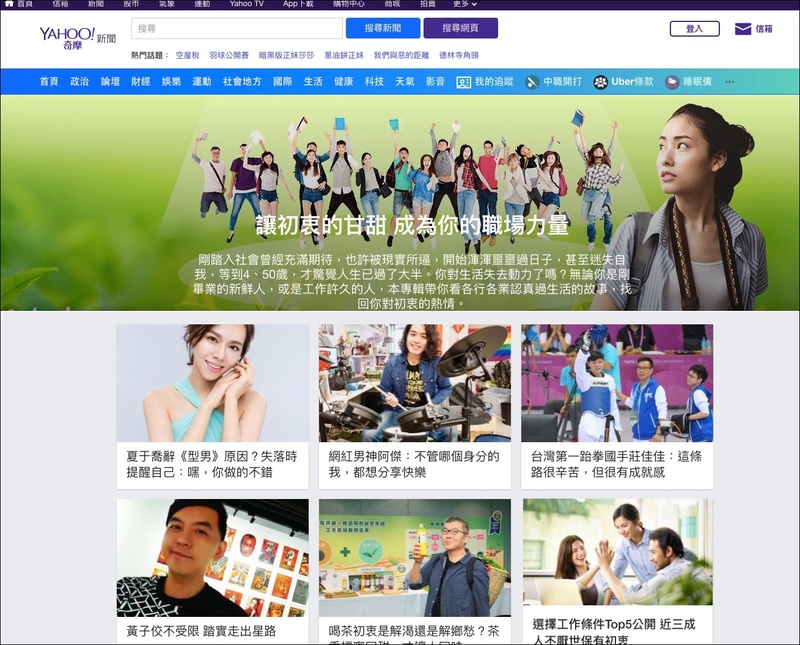 First, customized creative content including videos and articles were featured on Yahoo News (pictured below) and the King of Tea 'Initial dream' site (pictured above). This was enhanced by an integrated Yahoo media solution, including an audience ad and native pre-roll, to maximize the reach and create a buzz during the campaign period. Finally, the company deployed an owned-media fan page, which tapped into the social-media power of celebrities and influencers to expand the campaign’s reach and engage with the target audience. Verizon Media created three compelling videos featuring Taiwanese celebrities. Artist Huang Zijiao, social entrepreneur Shen Xin-Ling and baseball player Chen Yung-Chi detailed their own 'initial dreams', how they achieved success, and how they maintained their passion for their chosen career. These videos were amplified across Yahoo sites, network media and Yahoo social media. Additional OOH media across Taipei MRT stations maximised launch awareness. The videos were streamed more than 4 million times, which was 136% of pre-launch expectations, and the campaign pages were viewed 495,000 times, a 165% achievement rate. Post-campaign research revealed a positive impact on brand awareness and consumer loyalty. Almost 70% of those surveyed said they liked the content, while purchase intent among those who had seen it stood at 71%, versus 66% in a control group. Brand-image awareness reached 67% among those who had viewed the campaign, a full 10 percentage points higher than those who had not. Overall, the campaign recorded 11 million total impressions and 5.3 million streams, and reached 5.1 million people at a CPC of NT$4 to NT$5 (US$0.13 to US$0.16) less than the average.